If you’re a serious diver looking for a lightweight, high-performance regulator with rock-solid reliability then you should definitely consider the Atomic T3. This new regulator is an upgrade to the popular T2 signature regulator from Atomic Aquatics. It’s considered to be the highest specification regulator currently on the market. In this review, you will find out why its all Titanium body and components, precise machining, and clever designs come together to deliver a smooth breathing, high performing, scuba regulator in a compact and lightweight package any traveling diver would envy. Lightweight and durable, makes an excellent travel regulator. Spectacular Breathing Performance that's hard to beat. The Atomic T3 is designed for divers who want the best. It is packed full of groundbreaking features and functions and machined from exotic materials to deliver the lightest, most reliable, and best performing regulator available on the market to date. Who Is The Atomic Aquatics T3 Designed For? Below is a complete video overview of the Atomic Aquatics T3 regulator, it was done by the guys over at SimplyScuba.com. In the video, you can get a closer look at the regulator and some of its most important features. The T3 first stage body and internal metal components are precision machined from solid titanium billets. Atomic claims this exotic metal was their first choice when they sat out to design the lightest, highest performance, best corrosion resistant, and best-looking regulator – period. The major difference between this version and the T2 is the focus on reducing weight, making an already light regulator even lighter. Atomic looked at every piece and component of the regulator, stripping unnecessary metal to reduce the weight. Even the yoke and DIN thumb wheel have been designed to make them lighter. The result is a regulator system that weighs under 1.7 Lbs (Yoke) including the second stage and hose. Following the same principles of the first stage, Atomic’s T3 second stage has also been designed to save weight while delivering the best performance possible. It uses a balanced valve system to ensure breathing resistance is kept to a minimum while all internal components are made from titanium to help reduce weight and resist corrosion. To provide better comfort and reduce tug on the second stage, it is equipped with a full titanium comfort second stage swivel. Unlike your average aftermarket swivel, it offers a far much easier moment. It is also coated with a PVD finish which better resists scratches that might impede movement of the swivel as well. In addition to being the lightest full-sized regulator, thanks to new and improved components and features, you don’t need to get it service for an unheard of 3 years or 300 dives, making it also one of the most reliable. It also has a lifetime warranty that is not contingent on service. The lightweight and corrosion characteristics make it great Great choice for dive professionals and traveling Divers. Titanium body and components makes this regulator vertically indestructible and corrosion resistance. The T3 is an expensive regulator, but you are paying for exotic material that are not exactly cheap either. It’s easy to see why the Atomic Aquatic T3 regulator has gotten top rating from reviews for the past few years. It performs as expected and delivers smooth effortless breathing with little distanced. You might even forget you’re breathing underwater. Instead of thinking about your breathing, you can spend more time concentrating on other things and enjoying your dive. The first stage swiveling torrent helps to reduce the amount of tugging on the hoses. When combined with the titanium ball joint on the second stage you can move your head without the feeling of the regulator being pull out of your mouth. You will not need to bite on your mouthpiece as hard which will greatly reduce jaw fatigue. We also like that there is one simple knob to adjust breathing resistance. The Venturi is handled automatically so there is no additional witch to worry about when you reach the surface. Also, while many regulators require annual servicing to ensure they work properly, the T3 has an unheard of 3 years or 300 dive service interval. There are also stories of these regulators going much longer than this without any issues, a testament to its innovative features, precise machining and material choice. It’s really hard to fault the Atomic T3 except for the price. This is not a cheap scuba regulator, however, it priced really well when compared to other all-titanium regulators. But, consider this might be the last regulator you will ever need to buy, the price might definitely be worth depending on where and how much you dive. Also, although it is rated for cold water diving it would not be our first recommendation for glacier diving due to the thermal characteristics of its titanium body. The Atomic T3 Regulator is quite expensive when compared to most regulators. If you’re a diver who only dives a few times a year, the cost definitely out weights the benefit that a less expensive regulator will give you. Divers who would benefit most from these regulators are a professional diver or recreation divers who dive often. You can pretty much recuperate the cost of owning the regulator in a few years just on service and maintenance costs alone. Since you don’t have to service it that often. Its lightweight and corrosion resistant also make it very attractive for traveling divers. Especially when diving in exotic locations where servicing and parts aren’t readily available. What Octo works best with the T3? Atomic safe seconds SS1 attached to your BCD or any other Atomic Octo would work great. Is this regulator only for Tech Diving? This regulator work great for recreational diving as well. If I never dive in cold water, only in the tropic at recreational depth, is this regulator worth it? There are plenty of other cheaper regulator that will work perfectly for the type of diving you intend to do. However, if you're looking for the best and you have the budget, then go with this regulator. 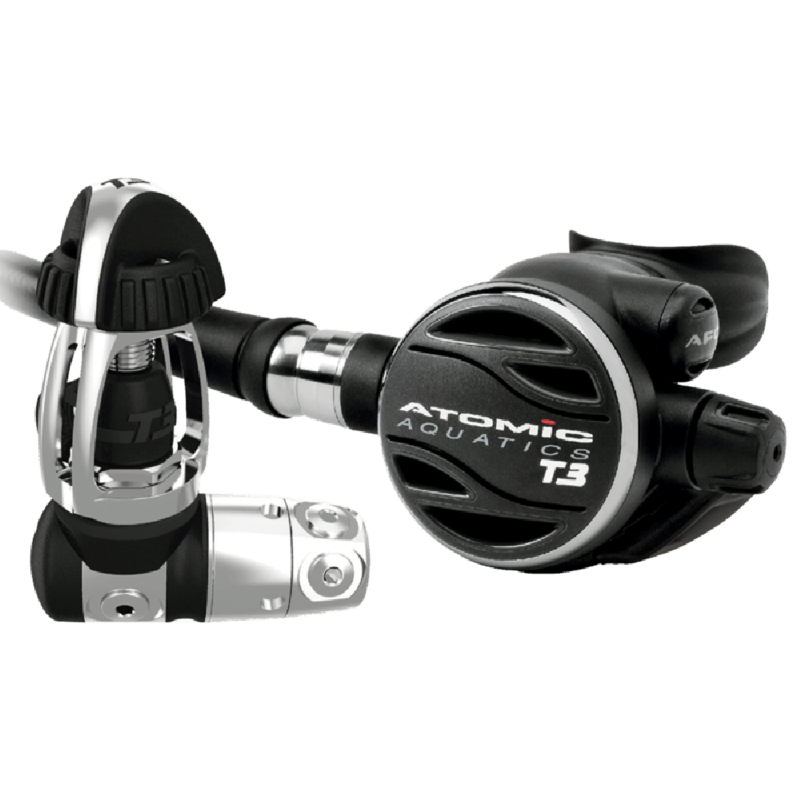 If you are a diver looking for the very best regulator and money is no object then you should defiantly pick up the Atomic T3. It delivers all the performance and more you would expect from a high-end regulator. Lightweight and corrosion free it is also a great companion for the traveling diver. It is quite expensive but you definitely get what you pay for. Do you have any experience with the Atomic Aquatics T3 Regulator, good or bad, please feel free to share your experience in the comments below.